(TibetanReview.net, Mar07’16) – Tibetan delegates, not all of whom are Tibetans, to the annual meeting in Beijing of China’s ceremonial parliament are sporting two unique lapel pins displaying their loyalty to the Chinese leadership in marked contrast from delegates from other regions, reported the AP Mar 5. 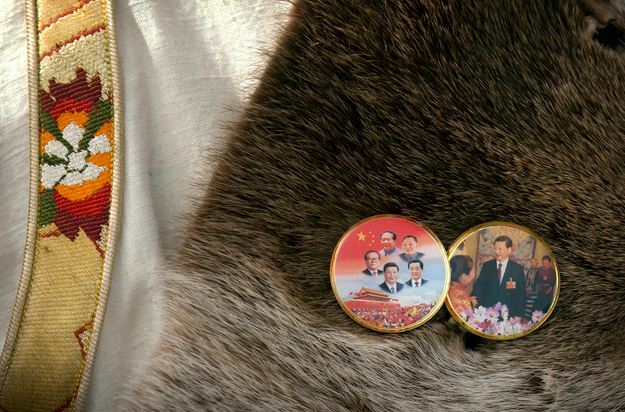 New this year and not seen on any other group of delegates, one of the inch-wide round pins shows a Chinese flag and busts of five Chinese leaders, from revolutionary founding father Mao Zedong to current President Xi Jinping, the report said. It added that the other shows a smiling Xi visiting a Tibetan family. 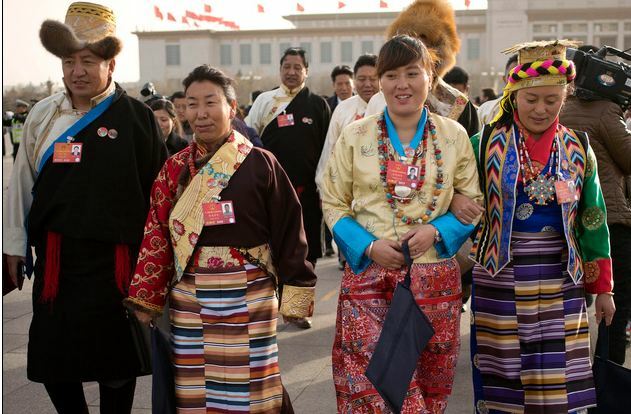 “We want to express our gratitude to the Communist Party leadership and State Council, so it’s only natural we wear the pin of the leaders of five generations,” the report quoted Hongwei, one of the 18 delegates from the Tibetan Autonomous Region, as saying at the Mar 5 opening session of the National People’s Congress. The report described Hongwei as Tibetan, although the name sounds Chinese; but there are Tibetans who bear Chinese names. The report noted that images of Chinese Communist leaders were common in Tibet, which remains under much tighter party control than the rest of China following a history of political volatility, and is generally off-limits to foreign journalists.